Nowhere near the madness of the real Palio! 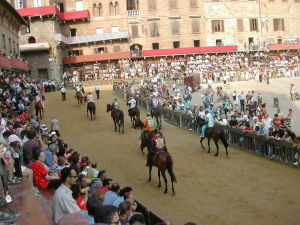 Siena’s palio is always held on July 2nd and August 16th. The trials that take place in the morning begin at at 9:00am. In the evening, there are trials at 7:45pm for the July Palio and 7:15pm for the August Palio. For the morning trials, plan to arrive between 8:30-8:45am. For the evening trails, plan on being in the piazza one hour in advance of the start time. This entry was posted in Tuscany and tagged horse race, Italy, palio, Siena, Tuscany. Bookmark the permalink.